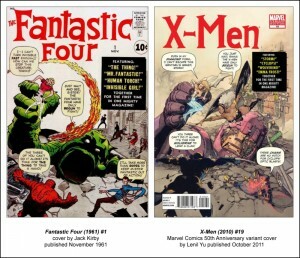 Last Fall, Marvel Comics released a set of 50th Anniversary variant covers on a number of their titles shipping between October and December. As expected, the 50th comes just two years after the publisher’s 2009 “70th Anniversary” as they combined their history as Marvel, Atlas and Timely Comics. The variant covers associated with that celebration featured individual characters from across their publishing line and can be found in some of our earliest posts (in parts one, two, and three). The theme for the 50th Anniversary covers pays homage to iconic covers from the publisher’s history by putting characters from other franchises into the place of the originals. Look inside and we’ll line up the new take along with its inspiration for what amounts to a fun set of covers even if they’re not particularly visible on shelves. A complete gallery and list of issues can be found below.